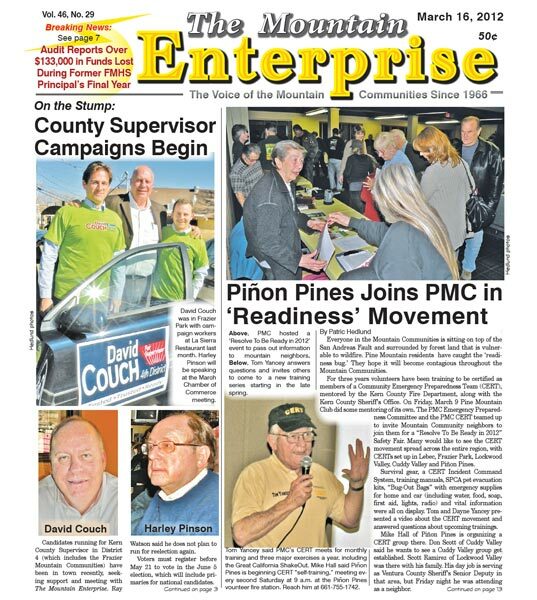 David Couch was in Frazier Park with campaign workers at La Sierra Restaurant last month. Both candidates will appear at the April 4 candidate forum hosted by Rotary at La Sierra Restaurant in Lebec. The meeting is open to the public. Harley Pinson will speak at the March Chamber of Commerce meeting. 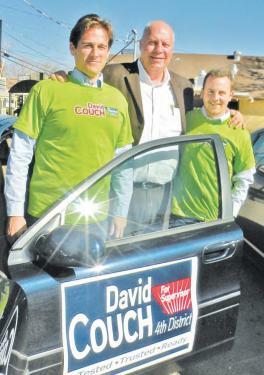 David Couch will be at the April 26 Chamber of Commerce meeting. Both candidates for the Kern County Board of Supervisors District 4 seat will appear at the April 4 candidates forum hosted by the Frazier Park and Mountain Communities Rotary Meeting at La Sierra Restaurant in Lebec. The meeting is open to the public. Harley Pinson will speak at the March Chamber of Commerce meeting. David Couch will be at the April 26 Chamber of Commerce meeting. 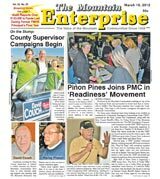 Candidates running for Kern County Supervisor in District 4 (which includes the Frazier Mountain Communities) have been in town recently, seeking support and meeting with The Mountain Enterprise. Ray Watson said he does not plan to run for reelection again. Voters must register before May 21 to vote in the June 5 election, which will include primaries for national candidates. 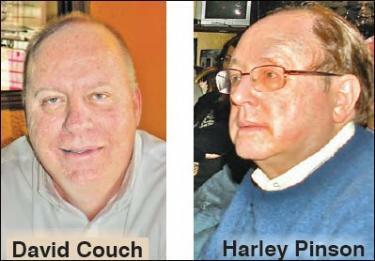 The deadline for filing as a candidate was March 14 at 5 p.m. On March 13 only two candidates had filed. David Couch was the first to make it official. 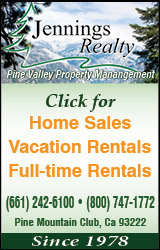 He is a financial planner and 14-year Bakersfield City Council veteran (www.votecouch.com). He is facing off against oil industry attorney Harley Pinson (who is tweeting at http://twitter.com/#!/ harleypinson). The Mountain Enterprise will be inviting both candidates to participate in a printed candidates’ forum, with questions selected from those submitted by our staff and the public. If you’d like to suggest a question, please send it to Editor@MountainEnterprise.com with the subject line: Kern County Supervisor. A third candidate, Michael Rouw of Bakersfield, said earlier he wished to run, but had not filed his application by the time we go to press, nor released a public statement to the press. He does not appear to have a website. Appearances: Both candidates will appear at the April 4 candidate forum hosted by Rotary at Los Piños Restaurant in Lebec, at 6 p.m. All members of the community are welcome to attend. 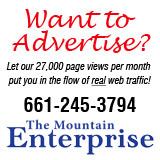 The Mountain Communities Chamber of Commerce will feature comments from Harley Pinson at Holiday Inn Express in Lebec at 7 p.m. Couch will appear at the April 26 meeting of the Chamber of Commerce. The Kern County Elections Board says that four (4) seats are opening up on the fiveperson El Tejon Unified School District Board of Trustees. Anita Anderson is the only ETUSD incumbent whose seat is not up for election. The five person Frazier Park Public Utilities District will have three seats opening, and two seats will be opening on the South West Health Care Board. Candidates for all these offices can file from July 16 through August 10, for the November 6, 2012 ballot. Call the Kern County Elections Board at 868-3590 for more information. 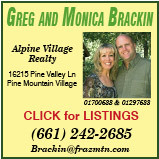 This is part of the March 16, 2012 online edition of The Mountain Enterprise.